Here I am on week five and I'm still feeling that determination to keep going. As I think I mentioned in my last post (I can't remember, it was a whole week ago!) I was starting to have low syn value sweet treats. The only thing with that is that I do believe once you get a taste of something again it can be quite hard to take that taste and addiction away. 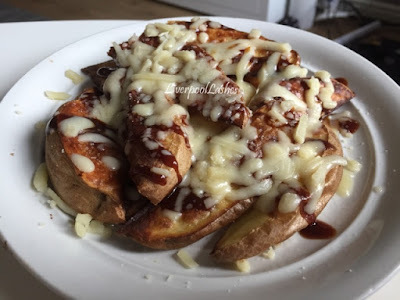 For that reason, I have tried to limit the amount of sweet things that I've had this week and use the syns on more savoury things like sauces and a little extra cheese. 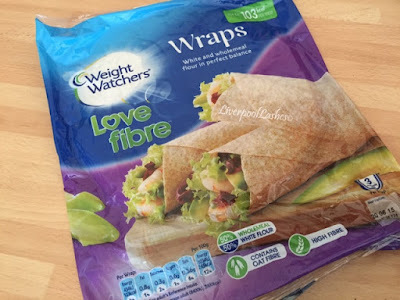 A new discovery for this week was Weight Watchers Wraps. They come in wholemeal and white, the wholemeal have a purple section on the front and the whites have a green section on the front. Originally I was under the impression that the wholemeal version classed as a healthy extra B but now I find out that Slimming World actually class both versions as a healthy extra B for one wrap. I have been using these wraps to make pizzas. What I do is I take passata, mix it with herbs and boil it in the pan to thicken it up. 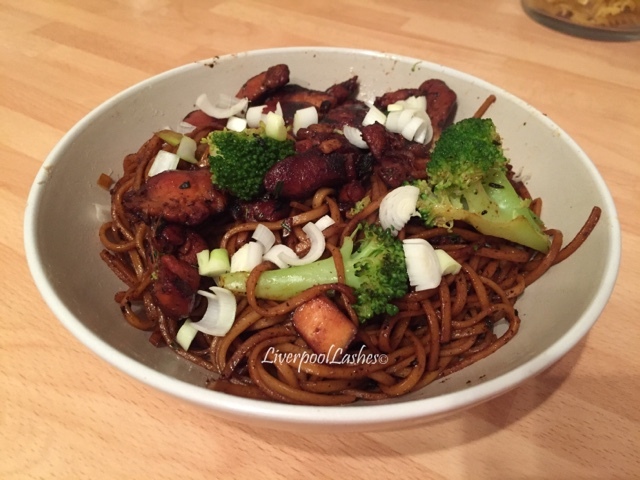 I then spread it on with the back of a spoon and add whatever topping I fancy, this is been typically mushrooms and chicken. I will then use my healthy extra A which is reduced fat cheese to sprinkle over it. As the bread is so thin I will cook them from between five and eight minutes. It's really easy to do and they really do taste like you're eating a regular pizza just with a thin base which is what I prefer anyway. 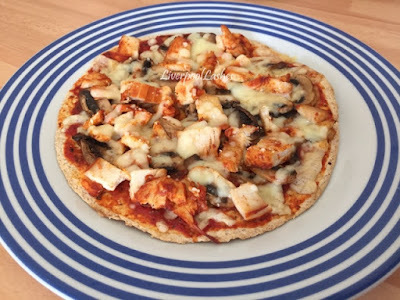 In the past I have tried to make Slimming World Smash pizza but it just didn't taste anything like bread and I didn't like it so this is our authentic version because you do have every flavour of an average pizza. I also think it's a good thing to do when you're limited for time or just when you want something a little bit lighter, particularly with warmer weather. Another thing I've been trying to do is to step up my vegetable game. I do like quite a few vegetables but the truth is I just wouldn't pick them (probably why I'm fat eh - hilarious) but in order to keep my digestive system going and hopefully shed some pounds, I've made a conscious effort to eat more. I do you make sure that I stay within the guidelines but that I also do have some really tasty treats. Above is Slimming World wedges with a drizzle of barbecue sauce and some reduced fat grated cheese. Towards the end of the week we had our delivery from Gousto. I do try and pick the healthy options from their menu. 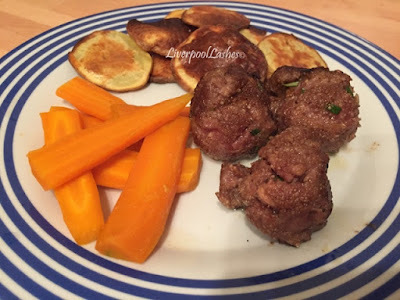 As you're cooking from scratch they're typically not too bad for you anyway, in terms of Slimming World normally there's only one or two ingredients that I may need to syn or substitute. The above photo or lamb meatballs and below are super chicken noodles, both using honey which I just synned. Below is something that I like to eat when I just need a really good lunch that's going to see me through for quite a few hours or fun dinner. 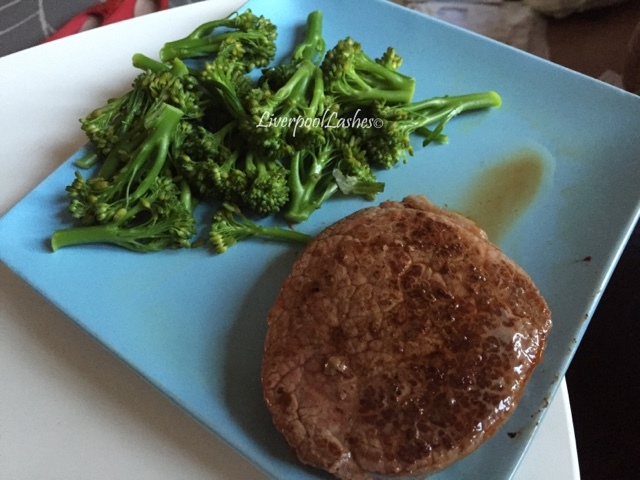 It's the sort of meals every now and again that just make me feel like I'm eating normal food are not "diet food." It's all psychological, if I feel like I'm eating something "diet" then I can sometimes feel like I'm being somehow deprived so this is good for that and what makes it even better is it's completely free on Slimming World. Hilariously, generally I don't get through this any more. 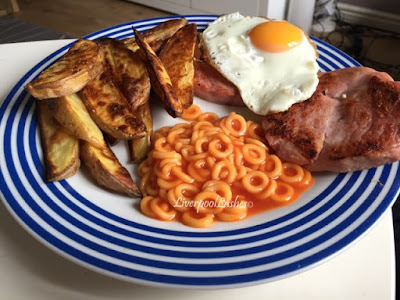 What you see here I actually left the egg, one of the gammon pieces and a few of the wedges as my stomach is definitely shrunk a lot. Another new find for the week is that Muller Light have a new multipack out with three summer berry yoghurt's and three raspberry and peach. 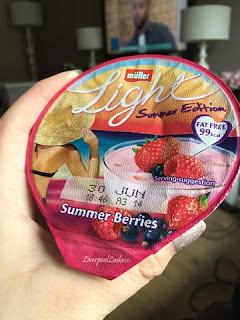 I do love that Muller always bring out new flavours as it means that I'm never bored of them. Something else that is keeping me focused is looking at other peoples losses. 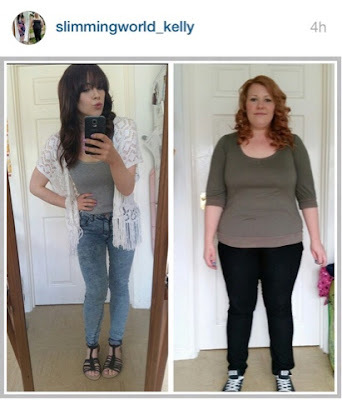 A huge inspiration for me has been someone called Kelly on Instagram. 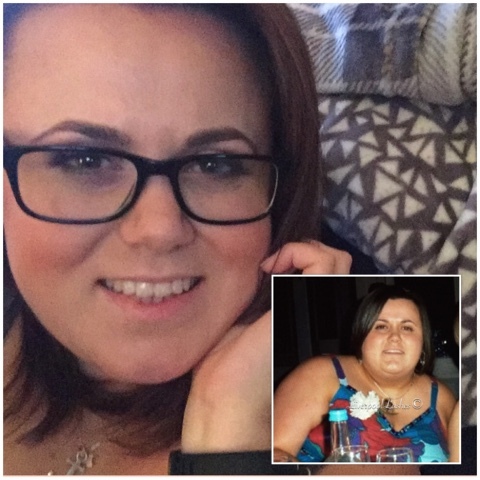 Kelly lost seven stone and 44 weeks, that's an average of just over 2 pounds every week. It shows me that this can be achieved, I just need to not give up. Within this past week my mum got a Fit Bit so now between my husband (as he has one too) and my mum we do daily challenges which encourages me to move more. My husband is very active so to be honest I'll probably never beat him but that doesn't stop me jogging on the spot just to beat my mum...! 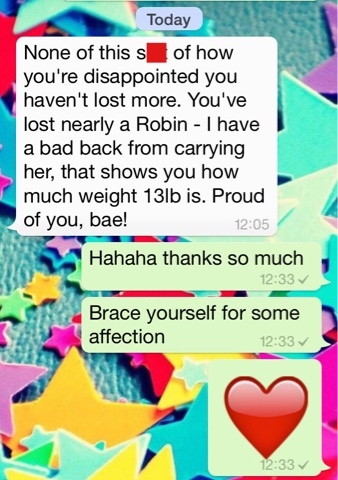 So on that note I'll talk about my weigh in today which honestly, I've had a little cry about this morning. At this point I can really tell that I've lost weight, my waist goes in like it should do now and I can see that my face is less of a bowling ball shape now(!) Stepping on the scales this morning I couldn't have been more shocked to learn that I've lost 3 and a 1/2 pounds. This brings my total to 16 and a half pounds in five weeks. Not only that, it also brings me so close to the next weight bracket down. I'm trying to pinpoint the reasons why it was quite a lot more than previous weeks and the only thing I can think of is the vegetables, cutting down on sweet treats for syns for sauces instead and moving a little more (but don't get my wrong, it's still not an awful lot.) I wish I could bottle this feeling up because right now I feel amazing and I'm ready and raring to go for this next week. Every day we have a choice, it's a fresh start and the most important part from any healthy eating plan is to just try and make as many days, good ones. Losing a pound a week is still over three and a half stone in a year! If you're feeling particularly down about your weight, remember that if you stick to a balanced diet then by this time next week you could have dropped quite a few pounds, just the kick start you need to get going! Even just by cutting down on treats you could make a difference, how good would that feel?! If you have a FitBit then why not be my friend on that and send me a challenge? click here. 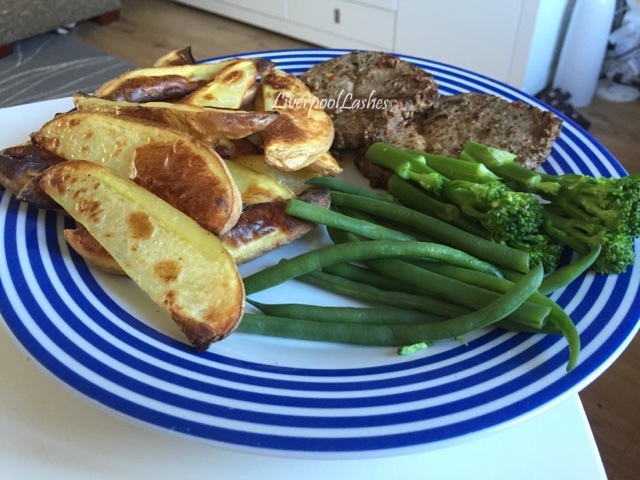 If you want to read my previous Slim Down Sunday posts - click here.